BU Maritime Archaeology is pleased to announce that we have been successful in the latest round for the Fusion Investment Fund. The upcoming project will involve publicising findings made by the BU team on the maritime archaeology of Poole Bay while investigating never before publicised sites. The project also carries particular significance for BU as this year marks the 10th anniversary of maritime archaeology at BU making this a special time and a unique opportunity to showcase the work that has occurred over this decade. Poole’s maritime archaeology spans most of man’s seafaring past and is a recognised international resource. It includes examples of palaeoenvironmental deposits, Bronze Age sites, Iron Age port facilities and logboats, medieval quays, 16th and 17th century shipwrecks, 19th century hulks, WWI aircraft carriers, WWII aircraft and amphibious tanks. Many of these have been investigate by BU’s Maritime Archaeology students and staff as part of teaching and research projects for over a decade since maritime archaeology was first taught at BU in 2004. This has included one of the largest shipwreck excavations undertaken in the UK, the first archaeological investigation in the UK of amphibious armoured vehicles and the investigation of one of the largest collections of abandoned watercraft in the UK. This work has involved teaching and research facilitating co-production with students working alongside staff, in many cases being involved i both the conception and publication of this work. In addition to archaeologists with an interest in our seafaring past we require a dedicated media team to document, record and publicise the work in innovative ways – creative juices will flow as the assembled team ventures in to the unknown armed with their energy, enthusiasm and limitless imagination to unearth the maritime mysteries held by the Bay since time immemorial. This will involve up to 10 days diving as well as land based exploration in the summer so you don’t have to be a diver to be involved! By land, sea and air we will begin our investigations in to the mysteries of Poole Bay. To express interest simply email Tom (tcousins@bournemouth.ac.uk) – we will be distributing application forms in the new year. It has been a good end of year at BU for Nepal research. Last week we had an ethics paper accepted on ‘Cervical Cancer Screening: Ethical Consideration’ in the journal Medicolegal & Bioethics as well as a research paper on ‘Sexual health knowledge and risky sexual behaviour of Nepalese trekking guides’ which will appear in 2015 in the Journal of Manmohan Memorial Institute of Health Sciences. We also had an editorial accepted on the importance of mixed-methods research in Nepal by the Nepal Journal of Epidemiology. The latter is linked to our planned Mixed-Methods Symposium on Saturday January 3rd 2015 in the city of Pokhara, Nepal (see our earlier BU Research Blog). Yesterday we heard that we have been successful in our grant application to THET. Our grant forms part of the Health Partnership Scheme (HPS) that funds health partnerships to carry out training and capacity-building projects in low-income countries. The Scheme is funded by the UK Department for International Development and managed by THET. We were delighted to hear that we have just received funding from the Fusion Investment Fund for a project which we hope will allow us to strengthen strategic partnerships with local/national engineering companies. This will build on the work already carried out within the Department of Design and Engineering to develop an innovate flexible learning MEng Engineering degree for those currently in employment which has attracted over 40 students from local and national industries since its introduction. The numbers entering the degree is expected to accelerate over the next few years with 300 engineering apprentices currently studying at Bournemouth and Poole College coming through the system. The aim of this project is to collaborate with current BU engineering students, and engineering employers to develop, launch and establish a Professional Registration Mentoring Scheme. The scheme will be developed to enable students who are studying on the flexible learning MEng Engineering degree to achieve professional registration (Incorporated or Chartered Engineer) status and for companies wishing to gain professional registration for a suitable group of their employees. This scheme is timely as EngineeringUK has recently highlighted the need to double the number of annual graduate recruits into engineering by 2020 to meet demand. The report also highlights it is estimated only 36% of engineers in the UK are registered as professional engineers. However, professional engineers are vital for the growth of the UK economy. Please do feel free to get in touch with us if you would like further information and we look forward to reporting on the outcome once the project is completed at the end of July. What costs £15 and smells of spent fireworks? Tear gas is used around the world nearly everyday, yet major international organisations, including the World Medical Association and NATO, state that not enough is understood about the real-life impact and health effects of these technologies. Responding to this lack of accessible information, in 2013 Dr. Anna Feigenbaum won a Fusion Fund grant to form the Tear Gas Research Connection — a group of researchers, NGOs, investigative journalists and tactical technicians keen to get to the ‘truth behind the tears’. Over the past year, Dr. Feigenbaum and John Horne have been collating data from humanitarian reports, medical journals, corporate correspondences, shipping documents, media reports and Freedom of Information requests in efforts to contribute to public debate and policymaking on this issue. With a year of research and networking behind us, this Tuesday we held our first stakeholder meeting at Birmingham City University. With support from BU Fusion and the Wellcome Trust, fifteen of our partners and advisors came together to strengthen the connections between our work and plan future projects. As tear gas use has tripled since 2011, there is a pressing need to find new ways to understand and communicate information on its physical and mental health effects. However, data on sensitive topics like tear gas is often kept hidden, deemed too confidential to be made open. This makes it difficult to gather health and human rights information, particularly on vulnerable populations (prisoners, detainees, those living in conflict zones). Likewise, detailed health and medical information, beyond basic safety instructions, is not often available in accessible formats. This leaves many people who suffer tear gas exposure unable to get the treatment they need. 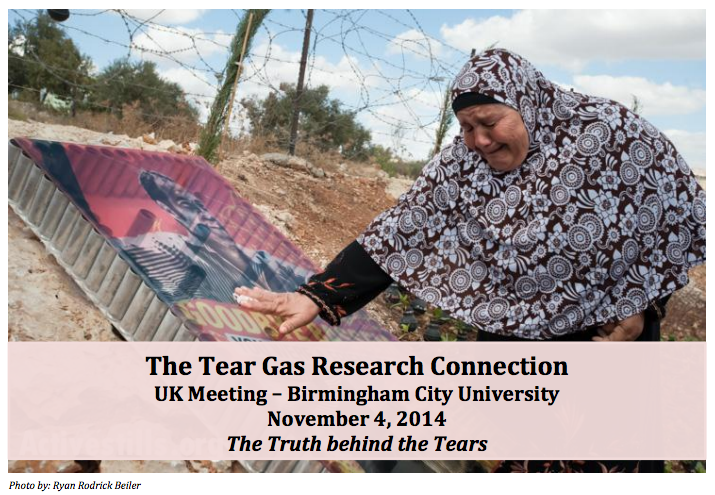 In response to these difficulties in data collection, two initiatives emerged at the Tear Gas Research Connection meeting. Plans are now underway to establish a medical team as part of the connection, bringing together toxicologists, GPs, Emergency responders, military medics and others with the newly formed tear gas task force of the European Respiratory Society. Coming together, this group will work to evaluate and re-issue an up-to-date field guide for dealing with the medical effects of tear gas. 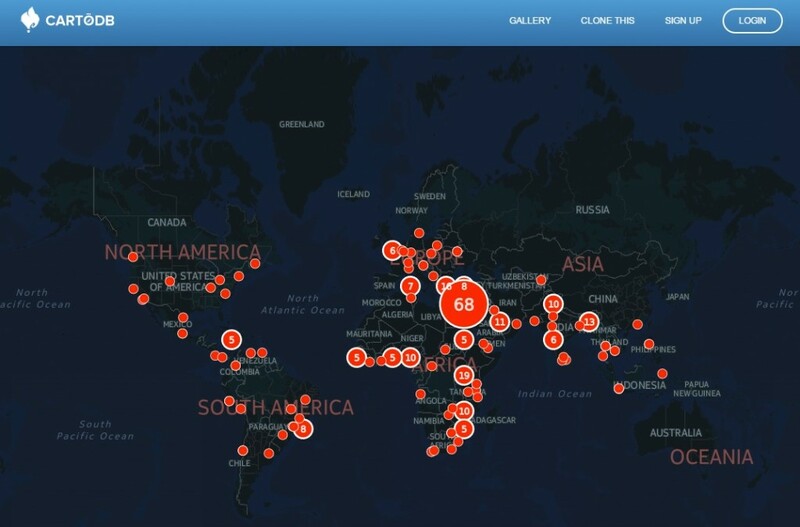 There were also discussions of how data mining and new archival methods might be used to help aggregate dispersed information, bringing global information together in one searchable place. 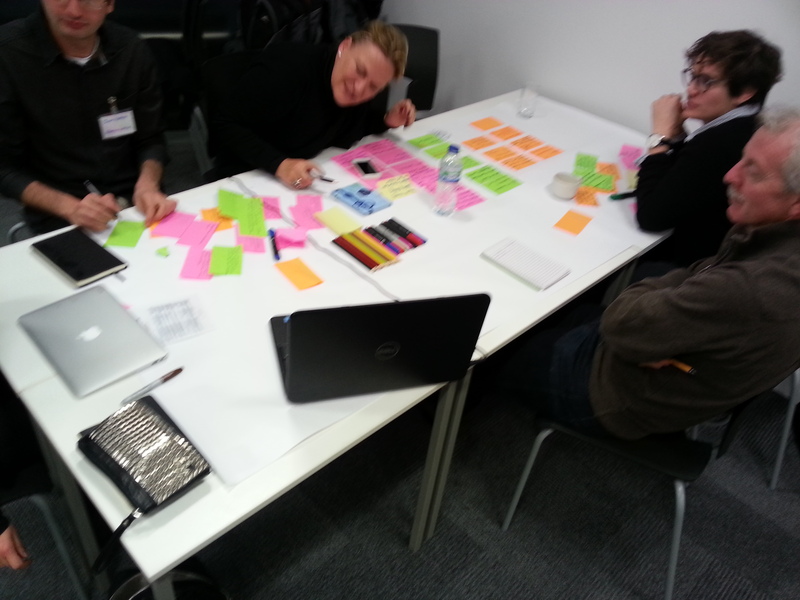 Central to all of our project ideas is an attention to the relationship between data and design. In this information age, it is crucial that we consider not just what the data shows us, but how we communicate those findings and insights to a variety of audiences. That is why our group is committed to holding face-to-face meetings with policymakers and making appearances in international media outlets. To date, our research has featured in newspapers, websites, broadcast radio and television including The Financial Times, The Guardian, Vice.com, Australian Broadcast Company radio, RT, SES Turkey and BBC Mundo, to name just a few. BU lecturer-practitioner Wendy Marsh based in Portsmouth has just been awarded The Royal Society of Medicine (RSM) Luke Zander Research Support Bursary. The prize of £500 and a year’s membership to the RSM was established to honour Dr. Luke Zander a founding member of the Forum and an innovator in maternity care. Wendy Marsh will receive the prize on 25 November at a meeting entitled ‘Looking back to the future: Challenges and opportunities in maternity care’, which will mark the 30th anniversary of the Maternity & the Newborn Forum. There has been much written on the latest developments relating to additive manufacturing or 3D printing as it is more commonly known. The recent rise of low-cost consumer 3D printers have also made the headlines and raised interesting and complex questions. However, there is limited literature and debate on the implications of 3D printing surrounding intellectual property law, economics, policy, society and technology. To understand these various implications, this event, co-sponsored by the ESRC and UKIPO and hosted by Dr. Dinusha Mendis Co-Director CIPPM, will bring together industry experts, social scientists, policy makers, lawyers, economists and manufacturers of 3D printing and as such will go beyond the developments in 3D printing in order to understand the implications for various stakeholders. It will take place on Friday 7th November, 2014 at Bournemouth University’s Executive Business Centre, 89 Holdenhurst Road, BH8 8EB (close to the main railway station). The event will also provide the platform for a discussion and peer-review of the UKIPO Commissioned Report on the Intellectual Property Implications of 3D printing carried out by researchers at Bournemouth University and Econolyst. This multi-disciplinary event will be complemented by an exhibition of 3D printing facilities provided by Bournemouth University together with one of the world’s largest 3D printing open-source companies, Ultimaker (Winner of Best Consumer Product and Best Consumer Software at the 2014 3D Print Show Global Awards). The event is free to attend, although spaces are limited and registration is required. Those with a research interest in 3D printing are welcome to engage in debate on the challenges and opportunities facing this latest emerging technology. Congratulations to all in the midwifery team for achieving re-accreditation as Baby Friendly. 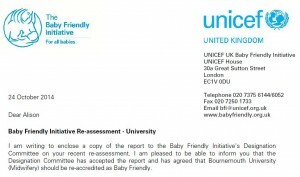 The UNICEF Baby Friendly Initiative’s Designation Committee recently re-assessed Bournemouth University’s Midwifery programme. 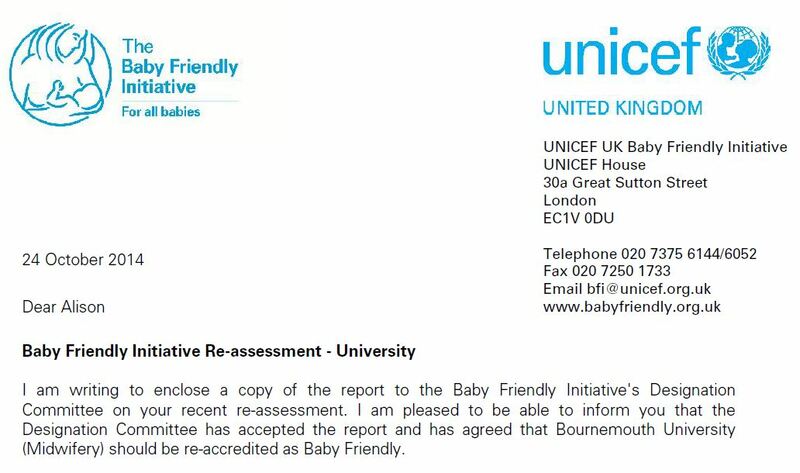 This committee reported earlier this week that “Bournemouth University (Midwifery) should be re-accredited as Baby Friendly. The UNICEF UK Baby Friendly Initiative University Standards programme is an accreditation programme aimed at university departments responsible for midwifery and health visitor/public health nurse education. It was developed to ensure that newly qualified midwives and health visitors are equipped with the basic knowledge and skills they need to support breastfeeding effectively. Baby Friendly Initiative accreditation is awarded to an individual course, not to the university itself. Universities are welcome to apply for accreditation for each of the courses they provide for the training of midwives or health visitors/public health nurses. 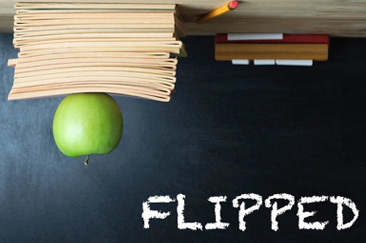 The idea for ‘flipping’ comes from education. It refers to the concept of students watching key content before they come to the classroom. Then when they do come together, they do so to grapple with and apply what they’ve been taught. This concept has been translated into healthcare by the CEO of the Institute for Healthcare Improvement, Maureen Bisognano. Instead of ‘what’s the matter?’ the flipped question becomes, ‘what matters to you?’. Put another way, healthcare needs to move from a system that does things to patients to one that works with them to achieve best results. These flipped changes imply that we need to work differently to improve things. Realising we needed to do things differently with the traditional research-based Master’s dissertation is where we were three years ago. In a previous BU research blog we have written how, over the years, we struggled with the relevance of this type of dissertation to professional practice, in particular social work services. That was why we designed the National Centre for Post-Qualifying Social Work’s service improvement programme, which uses an academically robust, practice-based, service improvement methodology with a focus on professional judgement. 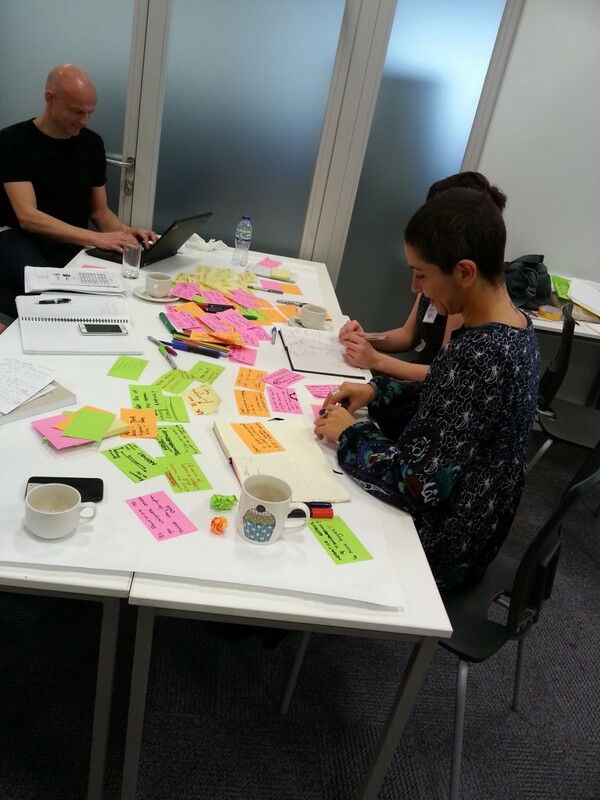 Towards the end of this Fusion Investment Fund networking project we realised that we’d flipped research for service improvement. As well as meetings with Maureen Bisognano and Jason Wolf (President of the Beryl Institute), we followed up a number of local contacts in the UK and the US to see first-hand how their way of doing service improvement works out in practice. Therefore, as a result of this networking project, we have widened our national and international networks considerably. And yes, we submitted a peer-reviewed journal article too; yes, we’ve written 5 blogs; and yes, we’ve updated our unit guides and improved the way we teach the programme; yes, we’ve fed back what we’ve learnt to others; and yes, we’ve thought of many ideas for future research projects – in one sense, these are not the main returns of enacting a project like this. The key benefit has been the inspiration to do these things. And that has come from being willing to learn from others. For all those on the edge of applying for a Fusion project, go for it! It’s been an inspiring few months and we’re grateful for the widening of our networks and related opportunities. We even learned how to tweet…wonders will never cease! I have taught at Université Paris Ouest Nanterre La Défense on a number of occasions but I continue to be impressed by the enthusiasm and challenging questions the Master’s level students pose. 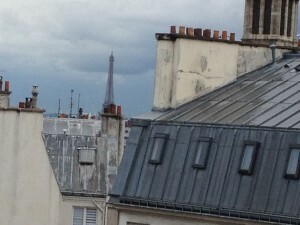 Paris is rich with culture and the education system has many benefits. 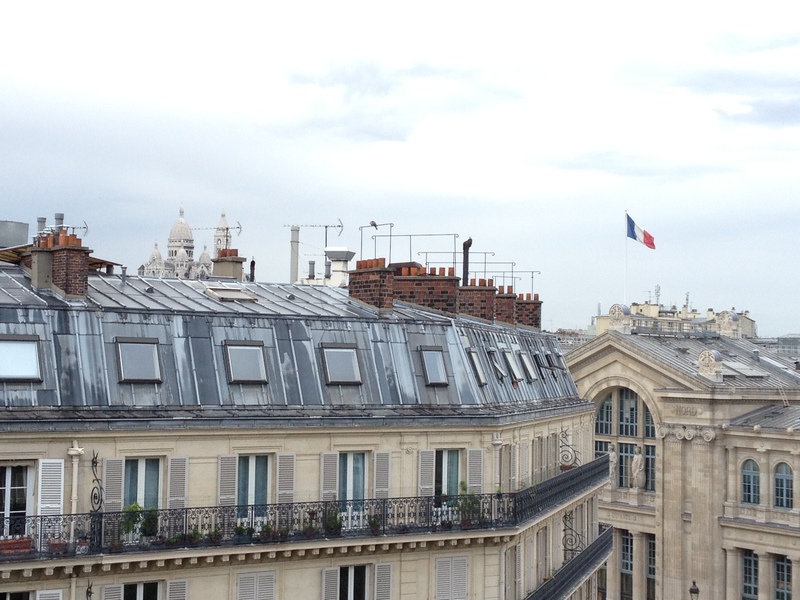 I am privileged to be part of a growing French research culture that respects skills and knowledge with cutting edge technology in neuroscience. Sacre Coeur, roof-top; Gare du Nord, r.
This complements my experience at Bournemouth University and has enabled me to collaborate on projects that face difficult challenges with respect to ethics and use of expensive technology, namely fMRI scanning. Functional Magnetic Resonance Scanning is notoriously expensive yet the benefits to clinical research are potentially huge. 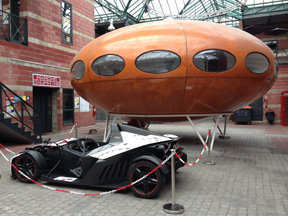 Modernism - or the Aliens have landed! My study on yawning and cortisol at Bournemouth University  has now includes collaboration with three prestigious centres in France: Université Paris Ouest Nanterre La Défense, Amiens University Hospital, University of Picardy Jules Verne. 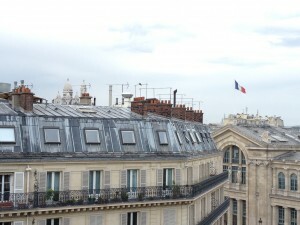 I hope to continue my Anglo-French meetings with the assistance of the Erasmus Travel Scholarship scheme in the future, as well as with funding from the French Embassy and the French Multiple Sclerosis Society. Thompson, S.B.N., 2014. Yawning, fatigue and cortisol: expanding the Thompson Cortisol Hypothesis. Medical Hypotheses. Doi: 10.1016/j.mehy.2014.08.009. The project Private Gains and Retailed Literature: pathways to an economics-based account of reading has just won FUSION funding for the coming semester. The project will ask why people consistently spend time and money on literature. What do they hope to gain? Since the opportunity costs are considerable, historically in terms of money and now in terms of time, readers must hope to gain something. On- and offline literature provides unique gains that have otherwise escaped investigation by English studies, which instead has preferred to think of meanings and literary achievement, rather than use. In terms of finding a discourse to investigate this, it should be remembered that the publishing industry and its delivery of fiction is by necessity predicated on commerce, while the markets for published fiction make up part of commodity culture. The language of private gain, of benefit and loss, which is the heart of commodity culture, is well suited for thinking about general-market reading. And if we can get passed the hijacking of economics by neo-liberalism, or get past neo-liberal reductionism that converts everything to financial indices, we may admit that economics has something to say about the mechanisms of gain, and about a specific type of reading in that commodity-cultural context. Headed by BU Senior lecturer in English, Dr Simon Frost, and in partnership with UNESCO Chair in New Media Forms of the Book, Prof. Alexis Weedon (University of Bedfordshire) and Prof. Claire Squires, Director of the Stirling Centre for International Publishing and Communication (University of Stirling), the project will be working with the JS Group/John Smith’s books to articulate in the language of cultural and media studies the role that books play in that international retail chain’s larger delivery of private gains. In addition, the project will conduct a student-led survey of the perceived benefits of retailed literature, across a number of UK book shops. Together, the student survey and JS study will greatly refine the project’s understanding of the qualities signified in book retail. It will help the project understand why people think books are important. Theories of literary value based solely on intrinsic value are under extreme pressure these days. How can one argue for investment in the best literature in the face of severe cuts to essential public services? And who is to decide what is ‘best’ – that debate being trapped in the notion of cultural hierarchy. This project instead aims at an explanation based not on l’art pour l’art, nor on the education of readers towards a supposedly more-culturally discerning state, but on the benefits readers obtain from the books they currently have in hand; on the books they currently value. A research team comprising RAND Europe and Bournemouth University have been awarded a research grant from NIHR to study Community Hospitals. Community Hospitals form an integral part of the NHS in the UK, this study looks at their distinct contribution to patient care. Community Hospitals come in all sorts of shapes, and can be located in rural parts of the country as well as in inner-city areas. In the UK community hospitals differ in the nature and scope of services on offer; some provide maternity care, others (also) A&E services or day-surgery or care for the elderly. There are a range of different models of ownership and management or the level of integration with other services. The study will also explore what comparable models of community hospitals exist in other countries high-income countries, and what the NHS can learn from it. Community hospitals may offer advantages for selected patients over larger hospitals, but unless we produce the research evidence we would not be able to tell which types of patients would particularly benefit. Community hospitals have a long tradition of providing more integrated care, perhaps something we can learn from to improve other hospital services and hospitals. Are you eager to have innovative ideas? Are you keen to find an effective method to solve your research problems? Do you want to speed up your research information collection? Cooperated among eight universities and companies around Europe, we are developing a virtual personal research assistant in our new European Commission funded project “Dr. Inventor – Promoting Scientific Creativity by Utilising Web-based Research Objects”. Dr Inventor aims to develop an intelligent software system utilising machine-empowered search and computation to bring researchers extended perspectives for scientific innovation. By informing researchers of a broad spectrum of relevant research concepts and approaches, this system will help assess the novelty of research ideas and offer suggestions of new concepts and workflows for new scientific discovery. 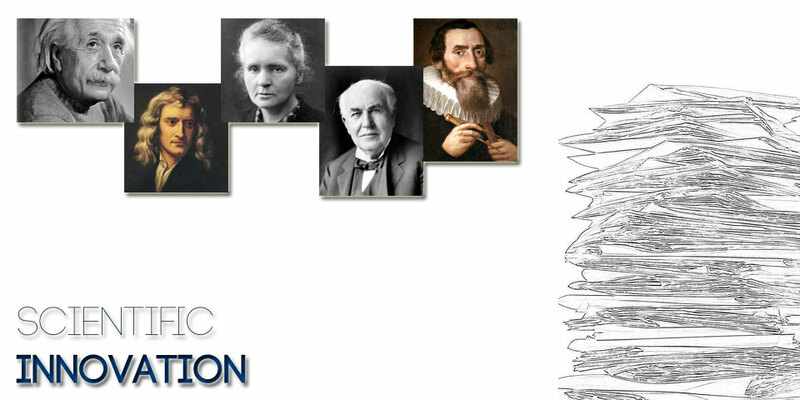 Dr Inventor will be the first web-based system that supports the exploration of scientific creativity via a computational approach, which will overcome a lot of human limitations. If you would like our system to work the way you envisage to do, please join our user requirement study by finishing a short survey (taking about 5 minutes) at https://www.surveymonkey.com/s/drinventor. You can tell us how you perform your research tasks, what is the most difficult part in your research, what you wish our system to do to help you. Your feedback will guide our design; your suggestions may steer the way how people undertake research in the next few decades. A new Erasmus Fusion Investment Fund for staff mobility and networking was awarded to Dr Clive Hunt, Lead Academic – Design and Engineering, Faculty of Science and Technology. This follows a recent Erasmus partnership agreement between BU and the University of Applied Sciences (FHWS) in Schweinfurt, which is situated in Franconia, Germany – one of Europe’s oldest wine-growing regions and described as “a land of wine and beauty” by the Franconian Tourist Board. As reported in a previous blog, the educational focus of FHWS is on design and engineering with a strong business/industrial focus. Clive’s visit to Germany, which has now taken place, was for a period of five days and included six hours of teaching as well as networking with two of FHWS’s industrial partners – ZF and Bosch and Siemens Home appliances (BSH). ZF is a worldwide leading supplier of dampers and clutches to the automotive industry and BSH’s product portfolio, which most will be familiar with, spans the spectrum of modern household appliances from stoves and ovens to small appliances like vacuum cleaners and coffee machines. From visiting these companies, as well as talking to staff and students at the university, it became very clear that the mind-set of the German industrial sector was such that it saw an active role in undergraduate development. Prof Dr Marcus Schulz of FHWS, explained that the German industrial sector saw placement students as being particularly valuable in helping to solve business problems and he commented that “the university’s industrial partners actually compete for students!” Companies provide undergraduates with a five month placement opportunity as well as providing almost all students with a final year project (thesis). To further the strategic partnership between our two institutions, Clive’s visit included meetings with the University’s Vice President, Prof Dr -Ing Bernhard Arndt as well as Prof Dr Uwe Sponholz, Dean of the Faculty of Business and Engineering. Developing joint research projects as well as encouraging student mobility between our two institutions is clearly a priority of FHWS and this aligns to the Faculty of Science and Technology’s (SciTech) own interest in furthering research and academic collaboration. From the beginning of next academic year FHWS will be delivering its courses in English which will provide SciTech students with an opportunity to study part of their degree abroad, providing units at BU can be aligned with theirs and delivery problems in terms of timing, etc., can be overcome. One area in which FHWS is keen to develop its research is around creativity and ideas generation by engineers and their managers and the university has recently developed one of its teaching spaces into a “Creative Cube” for this purpose. This room consists of a 70” touch screen computer, webcams, video cameras, an ambience ceiling with 40,000 LED’s, iPads, notebooks, relaxing chairs, a device that changes the smell of the room as well as having walls that are magnetic and which can be written on. If there are any colleagues, here at BU, who would like to get involved in a joint pedagogical research project between ourselves and FWHS, that considers how learning is impacted upon by the environmental conditions of a teaching space then please get in touch with Clive (chunt@bournemouth.ac.uk). Despite ankle fractures requiring surgery being so common, patients are managed in many different ways and there is debate over whether patients require prolonged periods immobilised in plaster or whether being able to actively move/use the ankle might be advantageous. £350k has recently been awarded to Poole Hospital and collaborators by the National Institute for Health Research’s Research for Patient Benefit scheme to find out! As the Research Design Service project lead, Zoe Sheppard helped facilitate the grant application bringing in statistical support, patient and public involvement advice, qualitative research expertise, health economic expertise, costing and research and development advice liaising with finance and research and development departments as well as the Peninsula Clinical Trials Unit. In addition to inputting into specific aspects according to their expertise, all co-applicants also extensively commented on the overall design and proposal, meaning a wide-ranging input. Two previous drafts were submitted to the mock funding committee. Six extensive written reviews were received from lay reviewers and methodologists as well feedback from the chair/panel members. So if you would like support with a grant application for health research, please get in contact as early as possible – we look forward to working with you! 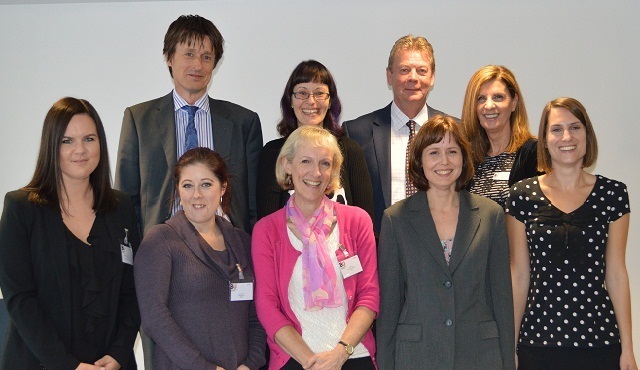 The Bournemouth University Clinical Research Unit Team! In April 2013, Research Councils UK (RCUK) launched their revised policy on Open Access with more gusto and clearer targets then ever before. Current and future research fundamentally relies on access to the findings and ideas that come out of publicly-funded research. Research Councils UK (RCUK) fully support the concept of universal access so that everyone can benefit from this knowledge. Their policy on Open Access aims to achieve immediate, unrestricted, on-line access to peer-reviewed and published research papers, free of any access charge and their vision is for all users to be able to read published research papers in an electronic format and to search for and re-use (including download) the content of published research papers, both manually and using automated tools (such as those for text and data mining), provided that any such re-use is subject to full and proper attribution. The policy applies to peer-reviewed research articles (including review articles not commissioned by publishers), which acknowledge Research Council funding, that are submitted for publication from 1st April 2013, and which are published in journals or conference proceedings. The policy does not (currently) cover monographs, books, critical editions, volumes and catalogues, or forms of non-peer-reviewed material. However, RCUK encourages authors of such material to consider making them Open Access where possible. It must make the work immediately and freely accessible online under a CC-BY licence. An ‘Article Processing Charge’ (APC) may be payable. BU has a central fund to cover these costs – the Open Access Publication Fund. The journal must allow deposit of the full and final text of the work (as accepted for publication including all changes arising from peer review) in a freely accessible online repository and without restriction on non-commercial re-use. An APC will not be payable. BU encourages researchers to deposit all articles upon acceptance in our instititional repository BURO via BRIAN. The choice of route to Open Access remains with the researchers and BU, both ‘gold’ and ‘green’ routes to Open Access are acceptable. However, the policy preference is for immediate Open Access with the maximum opportunity for reuse (i.e. ‘gold’). Works covered by the policy must acknowledge the funding source(s) using the standard format . They must also, if applicable, include a statement on how the underlying research materials – such as data, samples or models – can be accessed. In Year 1 (1 April 2013 to 31 March 2014), research organisations ensure that a minimum of 45% of their research papers (arising from the RCUK research funds) are published Open Access, via either route. In Year 2 (1 April 2014 to 31 March 2015), research organisations ensure that a minimum of 53% of their research papers (arising from the RCUK research funds) are published Open Access, via either route. At the end of the transition period, RCUK expect researchers and institutions to be fully compliant with the policy, and for 100% of research papers arising from the research they fund to be published in journals that are compliant with their policy on Open Access. With 75% of Open Access papers being delivered through immediate, unrestricted, on-line access with maximum opportunities for re-use (‘gold’) .